Anyone who has ever been faced with a beautiful, but broken vintage bead necklace or bracelet, please raise your hand. If your hand is not in the air, please stop reading now and go do something more productive; this article is not for you. The rest of you may now lower your hands; it will be more comfortable to read that way. When I first started collecting vintage, some of the most agonizing moments were when foraging in a box lot, I found gorgeous broken beaded jewelry. Or beaded pieces that looked like they were ready to break if I so much as breathed on them. Even worse yet; the necklaces and bracelets that were not broken, but were stretched and, because of appearance, basically unwearable and certainly unsaleable. As usual, I�m going to stray off my subject for a moment and issue a warning. Do NOT store or display your beaded necklaces hanging from hooks, edges of frames, etc. 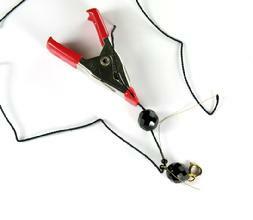 If they are strung on anything other than chain, the stress from hanging will stretch and damage them over time. Always store these necklaces and bracelets flat. Public service announcement is over! 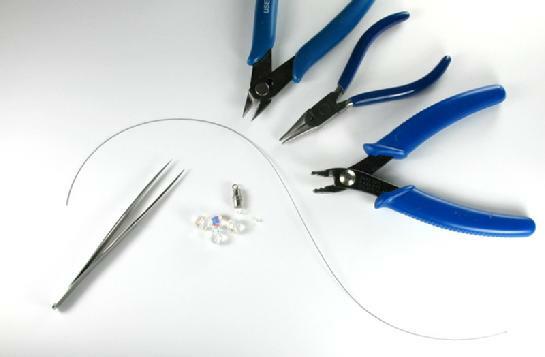 This month�s Jewel Notes is about restringing your damaged bead pieces. 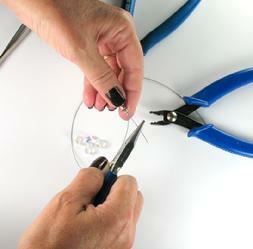 I�ll start with the easiest and quickest method, using beading wire and crimps. 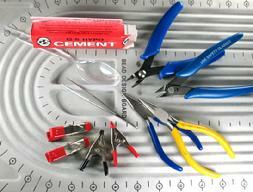 Here are the basic tools; cutters, long-nose pliers, crimping pliers, tweezers, wire, clasp, beads and crimping beads. You start by feeding the wire through the crimp bead, then through the clasp and again through the crimp bead. 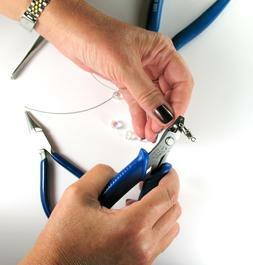 Use your pliers to pull the end and bring the crimp bead tightly up to the clasp. 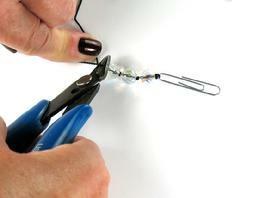 Next, use the crimping pliers to crimp the bead and close it. 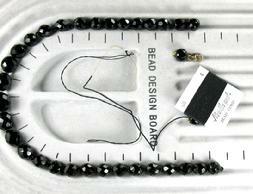 String your beads (being sure to encase the starting double wire) and finish the other end in the same manner. 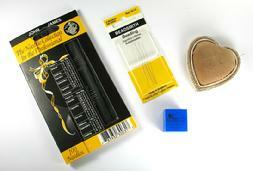 You can even use little �cover� beads to hide the folded crimp bead, as shown in the second photo below. Easy, right? Now are you ready for the bad news? Beading wire and crimp beads are a relatively new invention. Nearly all of your vintage necklaces and bracelets will have been strung on some type of thread, typically silk or, for newer pieces, nylon. Thread-strung pieces have a completely different �hand� or drape than those strung on wire, and they are finished using different methods to attach at the clasp. Should you ever use beading wire and crimps to re-do a vintage necklace? Well, yes, if it�s an inexpensive piece that you don�t want to either devote time to, or pay an expert to have it restrung. And, of course, this would be something that is staying in your own collection. In my humble, it would never be acceptable to use beading wire and crimps to restring a vintage piece meant for resale. The result would not be a vintage piece of jewelry, as stringing material is an integral part of any older necklace or bracelet. Making a new piece from reclaimed vintage beads; no problem. Using this technique and calling the result a vintage piece; big problem. So, obviously, we need to talk about how to string using thread. And I will now reveal my brainstorm in coming up with this idea as a topic for Jewel Notes. In 2007, I had my �Annus horribilis�. It was an awful year, and, if something didn�t involve life and death, it fell through the cracks. One such item was a lovely vintage necklace that a dear friend had sent to me for restringing. Well, I unearthed that necklace just the other day from its long-forgotten hiding place, and, voila, out popped the thought �Let�s do Jewel Notes about restringing!�. Restringing with thread is, without a doubt, much more of a challenge than using wire and crimping. And, it involves more technical aspects such as choosing which thread, which needle and which stringing method to use for your vintage piece. First, let�s take a look at some of the tools and materials. The next photo shows the necklace �before� with stretched thread showing at the bottom right corner. Note that I�ve positioned it on the board so that the beads will stay in the correct order once the thread is cut (photo two). Next, I select thread of a similar weight and type as was used for the original piece. After stretching the thread firmly and repeatedly for a minute or so, I condition it using Thread Heaven (or, if you�d prefer, plain old beeswax will do). 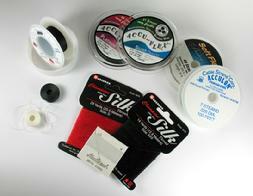 Conditioning is important as it helps the individual fibers of the thread to stay compact during stringing. All ready to start the fun part! In the next photo, you�ll see the first few beads being threaded through one clasp part, with a tail of the thread being back-strung to better secure the end knot. The knot is lightly dabbed with a bit of glue for extra security, then the rest of the beads are strung and the other end finished in the same manner with knotting, back-stringing and a bit of glue. That�s what would have happened in an ideal world. In MY world, it was discovered that some of the tiny spacer beads were smaller than the ones that I initially tested with the thread, and now would not agree to being threaded on the string. At this point, one has choices. Kicking and screaming or crying might be a gut reaction, but really won�t work well to move things along. Since these are very small glass beads, my second choice of using a bead reamer to try to enlarge the center holes wouldn�t work either. Choice number three; use a different thread. 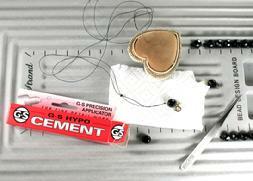 I decided on a thinner thread and doubled it, as you can see on the bead layout board. And, a few minutes later, all done! At this point, perhaps the non-beaders in the group might be saying, �Is Mary Ann out of her ever-loving mind thinking that I could do this stuff?� I will be the first to admit not everyone even wants to try restringing with thread. This article can act as tool to help you critique the job done by the professional that you hire to do your vintage pieces. Some of you may be tempted to try your own restringing and I strongly encourage you to do so. Nothing ventured, nothing gained. Many people actually find this type of work not only satisfying, but also relaxing. Of course, I personally think that those people are lying their pants off, but, hey, it might be true for some. And you will never know unless you try it! Lastly, I wanted to mention two other more-complicated issues that you may encounter when restringing your vintage pieces: Continuous strands, i.e. 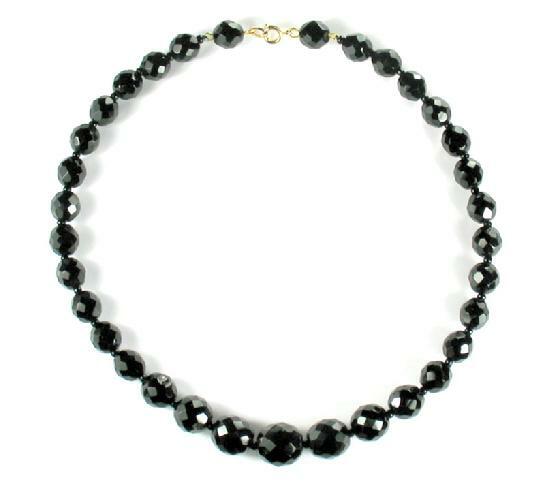 necklaces with no clasps, and knotted strands, where a knot appears between each individual bead. The next group of photos illustrates the process for making a continuous strand using a high-tech device otherwise known as a paper clip. After you�re done stringing all but the last three beads, the thread is looped back through the hole being held open with the paper clip and the tail back-knotted between each of those beads to finish the strand. 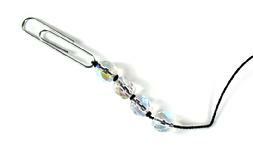 To tie the knots between beads, I use tweezers to hold and pull the knot tightly against each bead. Some people use a knotting machine to do this, but I find it quicker to do it my way. 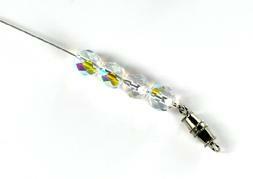 Many of my readers are now thinking that I�m simply showing off my bead-stringing skills. Well, you may be partially right about that, but I did want to demonstrate these variations. More-delicate beads, especially real and faux pearls, are usually knotted in order to protect the bead finish, keeping them from rubbing together. I would also imagine that many of you are thinking �What�s with the burgundy-colored perfectly polished nails? No way Mary Ann is doing this stuff without chipping her polish all the time.� That assumption is 100% accurate. I enjoyed a spa date with my daughter to celebrate her birthday a couple days ago, and had my nails manicured and polished for the first time in several years. My only regret with regard to the stringing demo photos is that I couldn�t figure out a way to also show off my perfectly-pedicured toes! For anyone wishing to try bead restringing on your own, i.e. 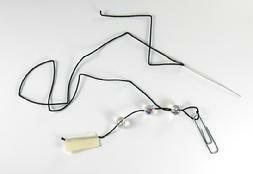 be self-taught, I would recommend that you pick up a copy of �The Basics of Bead Stringing� by Debbie Kanan. 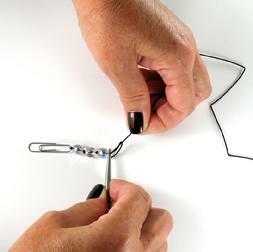 She does a fantastic job of describing the steps in detail for all types of stringing projects. If you feel you�d do better with some hands-on instruction, check out your local bead shop; nearly all of them offer some type of group class or individual instruction. For those who wish to send out their beautiful vintage beaded necklaces and bracelets for professional repair, please do not send them to me. 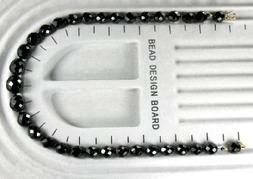 As mentioned, it appears that I�m about three years behind with my beading projects. But I do hope that our group members that do restringing will chime in. So, please get out your beautiful vintage beaded jewelry, and get busy supplying the tender-loving-care these pieces so richly deserve!